Special swim diapers or rubber pants must be worn by babies or younger children who are not toilet trained. Regular diapers may not be worn in the lake. The Township cannot be responsible for natural environmental occurrences in the Lake. Only Coast Guard Approved PFD’s (Personal Floatation Devices) will be allowed. No diving will be permitted from the floating dock. *Grandparents living in the same house as adult children must get a Senior individual/couple membership and must provide proof of eligibility ie: current bank statement or medicare summary.. The following fees shall apply to each guest each time he or she uses the facility. Guests must be accompanied by a paid member at all times. One member cannot take another family member from the same residence as a guest. Guest Bracelets will be issued and must be worn. Badges will be issued to every family member upon registration. The cost of replacing a lost badge will be $10.00. Members are required to wear their badges at all times while at the lake. 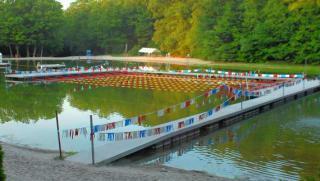 Members must stop and show their badges at the entrance to the lake facility. Picture ID may also be required. Register your family by going to www.westmilford.org , Click on “services”, then “Community Services & Recreation Registration”. Once you are in Community Pass follow the prompts to register your family. Online payments are by credit card only. If you prefer to pay by cash or check, you must still register your family online then come to the Recreation office at Hillcrest Community Center and drop off your check (made out to WMCSR) or cash. You still need to come in person to the Recreation office to show proof of residency and birth certificates for the children, and pick up your badges. All Lake events are held weather permitting. The Concession Stand is open and available to serve you daily. HELP OUR ENVIRONMENT! When disposing of cans and bottles at the Lake, please use the recycling containers provided for that purpose.